The Life of Brad: Feb 2008 gone already! My one year motorcycle crash Feb. 14, 2007. I definitely wasn't about to jump on a bike that day and I still don't have a bike here so it really wasn't an issue. San Francisco Bathhouse comedy/music venue; Saw an awesome concert there by 20 year punk/alternate band "Ween" from the US (Sold out; 500 people). Blew my mind. Also at the Bathhouse during February a comedy show host from Calgary, Canada and the former Host of "Hot nuts and Popcorn" famous for the creation of the "Terry" character from the movie "Fubar", was Derek Flores. I couldn't believe how small the world was yet again. He graduated St. Mary's High school in 1992, so some of you may know him from that. He now lives in Wellington and loves it! Started going on dive club dives which are still not that deep, but I am building experience. Nothing too exciting under the water, some star fish. We did see seals before getting in and the guide told us not to play with them. He said we may even have to punch them in the face as they can get a bit pushy. I'll be ready next time. Friday afternoon BBq at work, once Geoff and I put it together! Beers and all the food you could handle at the Octa house. BBQ, very light on instructions. 40 minutes later. 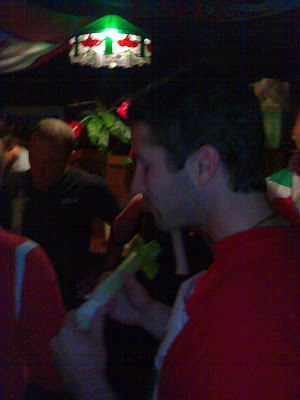 Partook in a leek eating contest at the Welsh bar " the Dragon" on St David's day (March 1). It has become my local as I have been trying to become Welsh since the beginning of Feb mostly because they told me I couldn't be Welsh. I figure eventually they will give in, hell they need more people anyway! 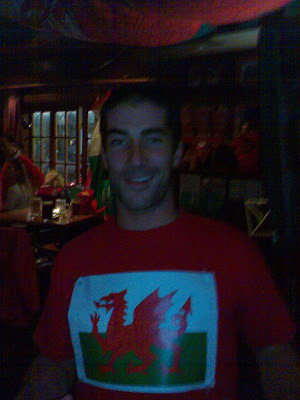 Homemade Welsh t-shirt. 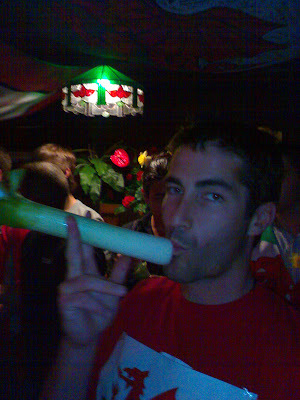 Eating leeks is one step closer and it is done every St. David's day, which thank god is once a year. Very painful! Basically the first person to eat a whole raw leek (green onion on Steroids) and pound a beer is the winner and gets a prize. I think a bottle of booze. Only one person finished and I got 3rd or 4th. A couple of guys got sick, so they were knocked out. Hating onions didn't help, but I had to do it. Not sure if I'm Welsh now, but I think they definitely want me around. Cheers to the Welsh crew; Mike, Jo, Mike and Tom. 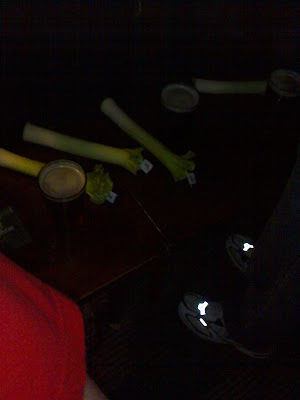 Row of Leeks and beers. Confident Brad. Spirit broken Brad.